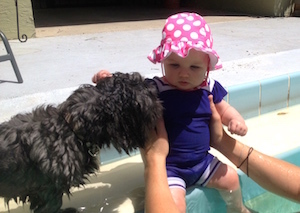 Dog Licking and Children | Is it safe for dogs to lick babies? We were wondering if it was ok if our dog licks our daughter. She is almost 5 months old and they seem to get along so it isn't so much a question of them getting along, we are concerned about possible bacteria from the dog's mouth getting in her eyes or mouth. I have read that as long as our daughter doesn't seem uncomfortable being licked that it is ok, but I wanted your thoughts. There is a potential health concern about dog licking. Dogs are known for licking their “rear-ends” and therefore their mouths can carry intestinal pathogens. So in theory, diseases could be passed from dog mouth to human mouth. Dog mouths can carry bacteria (salmonella, e coli, clostridia and campylobacter) and parasites (roundworms, toxoplasmosis, cryptosporosis and giardiasis). These bacteria and parasites typically cause significant cases of diarrhea in humans. Dogs on heartworm preventive medications should be parasite free. We too own a dog. While, I have never worried much about dog licking before, but after researching your question we will try to minimize our dog licking our children.